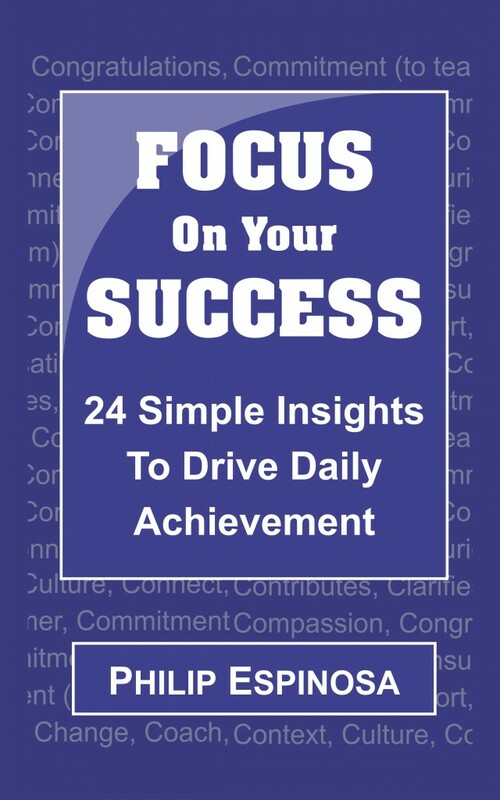 Focus On Your Success – 24 Simple Insights To Drive Daily Achievement is now available. – Improving your relationships with others? – Being more productive day to day? If so, then Focus On Your Success with 24 Simple Insights To Drive Daily Achievement. This book is a collection of simple and concise thoughts that busy business professionals can use as guides in their everyday professional life. When you focus on your success you will find there are things you can do for yourself, and, more importantly, things you can do to for others. There are, on average, 20 workdays in a month and four weekends. Read and reflect on one of these concepts at the start of each workday, and one each weekend. The challenge for us as professionals is to embrace these concepts with our intellect and to incorporate them into our actions — those things we actually do. Invest some time — Focus On Your Success.